What we expect with the 2015 storm season. Confidence is shaky with the upcoming season as we are entering the season with extremely dry conditions in the main storm forming regions along the foothills. Isolated heavy snowfall events have kept up moisture levels the Edmonton area and some nearby areas to the north-east, east, and south-east. It won’t come even close tot he normal for May unless a decent rain event comes(models are not showing that consistently at all) with some indicating we won’t see a drop until the middle of June. the 12z GFS was showing temperatures as high as 35C+ at the surface near the end of the month, with the low amount of soil moisture it won’t come as a surprise. Thunderstorm activity will be effected by three things this year. Blocking system that could bring in copious amounts of gulf moisture or desert heat into Alberta. 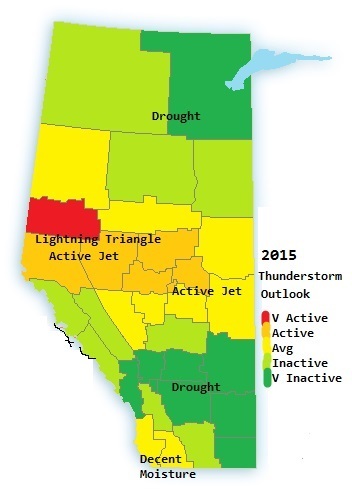 Mean Jet over northern Alberta and NWT will boost storm activity along the yellowhead highway and north which may see the return of 2006-2008 levels of activity to Edmonton while southern Alberta sees much lower thunderstorm activity. Developing drought conditions will result in low local moisture for transpiration and evaporation. LP supercells likely to be the hallmark of 2015. Here is a forecast map for thunderstorm anomalies over the 2015 storm season. It’s May but winter just loves to ruin the party. 15cm+ has already fallen is pockets and the intense snow band is still stalled over Edmonton. 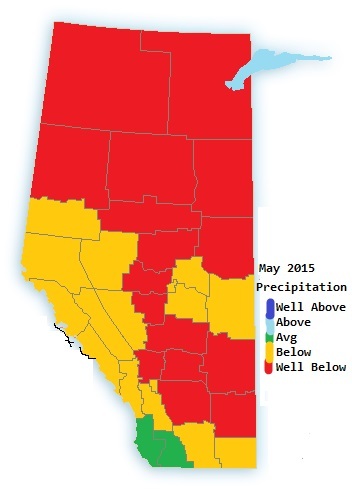 This is nearly the same kind of system that dumped 30-40cm on Wetaskiwin a week ago. 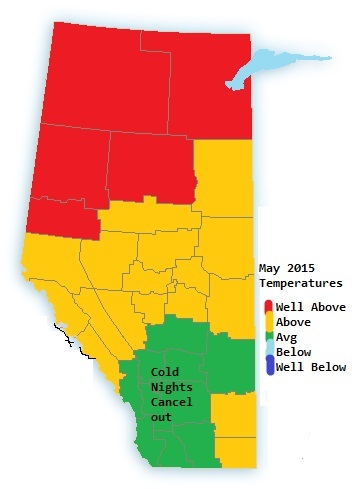 It remains uncertain whether the same amounts will pile up in the Edmonton area. Many trees are already in leaf due to the warm spring so damage can be expected. Just like with the Apr 25th snowstorm the hardest hit areas are localised and will be followed by a warmup. GFS, CFS and GEM are consistent with temperatures in the mid to high 20s through next week.